The traffic at Mandaue is quite gnarly these days, thanks to road repairs all over the city. 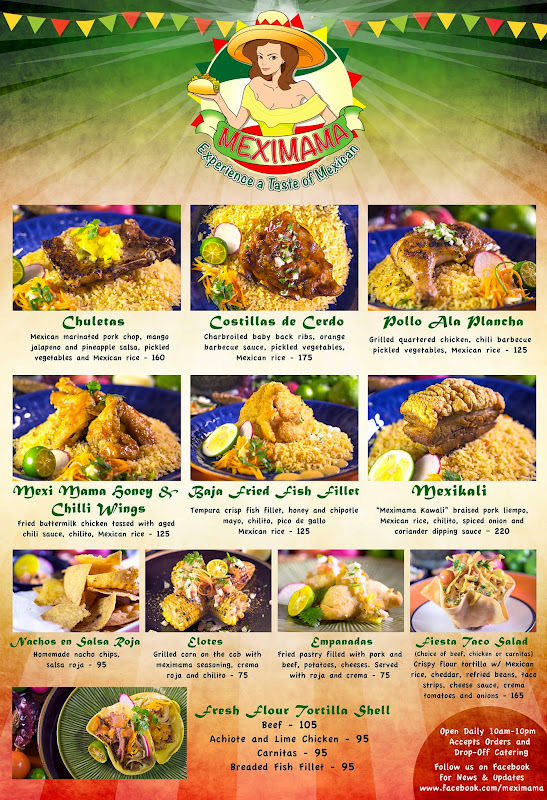 Although I don’t pass by the affected routes on a regular basis, I experienced one while I was on my way to visit MexiMama’s second branch at the Mactan Alfresco, a new ‘hawker-style’ center at Megaworld’s Mactan Newtown. I forgot already how long our cab negotiated the road jams that morning. But to give you some perspective, by the time I arrived at the venue, I finished reading a rather lengthy Wikipedia article on Mexican cuisine. Wikipedia is not the most scholarly reading in the universe, but at the very least it saved me from boredom and/or anger that usually ensues when your cab is stuck in a slow-moving lane. Thankfully, I arrived at the site just in time as the food was being served. I immediately spotted Chef Dennis uy, the man behind the newest Mexican-inspired diner in these parts, still composed despite shuffling back and forth from his kitchen and to his guests. And even with that kind of standard, he assures that each of their dishes comes only at just a fraction of a cost compared to what the chi-chi restaurants would usually charge. L-R: Homemade nachos and quesadilla. 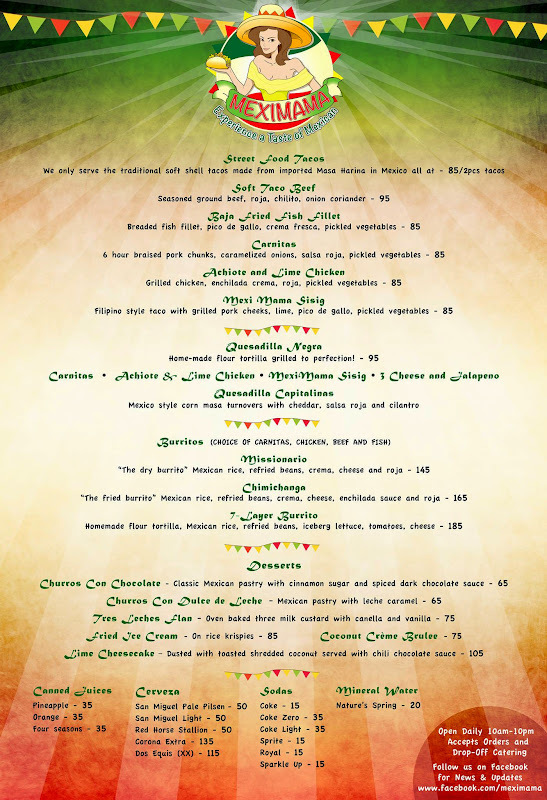 “Everything here at Meximama is homemade except the ketchup,” Dennis added. The various salsas, the nacho chips and the tortillas are all made from scratch which is not at all surprising since he and his partner chef both have long years of experience in various resorts and restaurants in Cebu. But while I enjoyed the quesadilla and other meals that afternoon, it was the desserts that surprisingly bowled me over. The indulgent Tres Leches Flan had the right ‘custardy’ consistency and flavor that reminded me of what my aunt used to bake back in the day. It was decadent in the truest sense of the word. Churros with caramel and dark chocolate dip. The freshly made churros came with two dips – leche caramel and spiced dark chocolate. While the latter was not as thick as I would have preferred, it complemented the savory pastries better than the caramel dip. I honestly wanted to try the 7-Layer Burrito, the empanada and their tacos, but since I have to be back in the city by 2 PM, I left Meximama shortly. I just made a mental note to try these dishes soon, even if that means that I have to brave through the Mandaue traffic again just to get here. After all, it’s one of the few restaurants in Mactan that’s certainly worth the long trip. So if the road repairs are not yet finished by then, I certainly wouldn’t mind. For MexiMama’s menu, please click here and here. Wa nangablit same isla ra mn diay mi ani.